The 331st Soundtrack of the Week is Ketteiban! 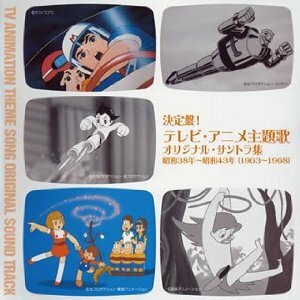 : TV Anime Main Theme Original Soundtracks 1963–1968. There's a lot of variety in these songs, and a lot more swing than I expected. While there are some gratingly childish themes and too many clunky choruses, as well as many militaristic or anthemic songs, there's also a gratifying amount of music that borrows from surf, mambo, exotica and slinky soundtrack music. And even the squarer numbers tend to have unexpected and unusual things going on in them. The theme from Wolf Boy Ken combines pounding percussion with a children's choir, a scatting male bass voice, wolf howls a curious piano chord and some blaring horn lines. The Space Ace theme is notable mostly for its weird and mysterious intro, though the melody, sung by children's chorus, is agreeably catchy. Planet Boy Papi's theme also has a really interesting beginning before going the conventional route with the song itself. "Leo's Song", has a driving twangy guitar and cool flute melody before the song proper gets started. "Mambo Magic", the theme from Sally the Witch, combines an operatic baritone with loungey jungle rhythms and some haunting horn lines. Mach Go Go Go is some kind of mini-masterpiece with its rocking rhythm, sound effects and energetic chorus. A rocking drum beat and occasional blasts of machine gun fire and frantic surf guitar make "Skaiyaz 5" a memorable tune. Perhaps the loveliest and most haunting is the theme to a show called "Sabu and Ichi's Detective Memoirs", wonderfully pensive and atmospheric. But those are just some of the highlights. This double CD has over seventy songs on it!